Our trained estimators have years of experience and are able to provide you with an accurate price, estimation of materials and time required to complete the job up front. Our mission is to ensure your project is done right and to your satisfaction. Our work philosophy known by our costumers as GIKAS the WIZARD is creatively carried from project to project enhancing your home with texture, colors and details in order to comprehensively restore its charming properties. When we arrive for your estimate, we will go over the entire house exterior, once complete, we will sit down with you and discuss any necessary preparation, and repairs that may be needed and finally help you pick and finalize your paint colors. 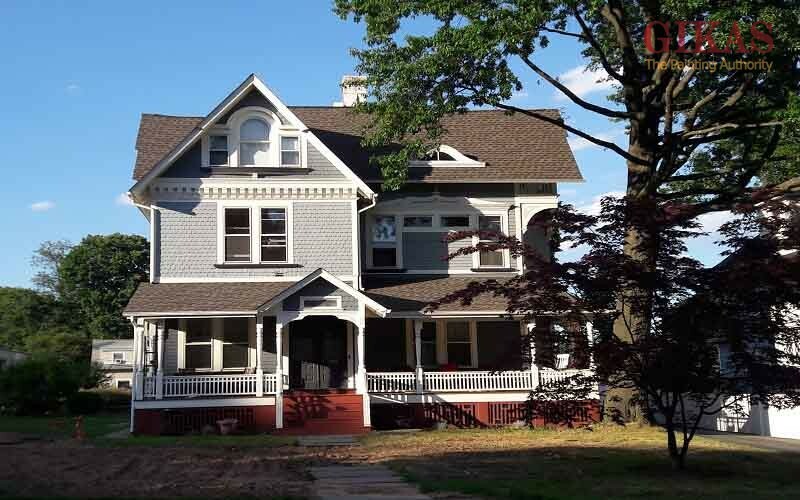 Take a look at our new Exterior Painting project in Montclair – New Jersey! Chimney in Madison – Reprinted and Painted ! 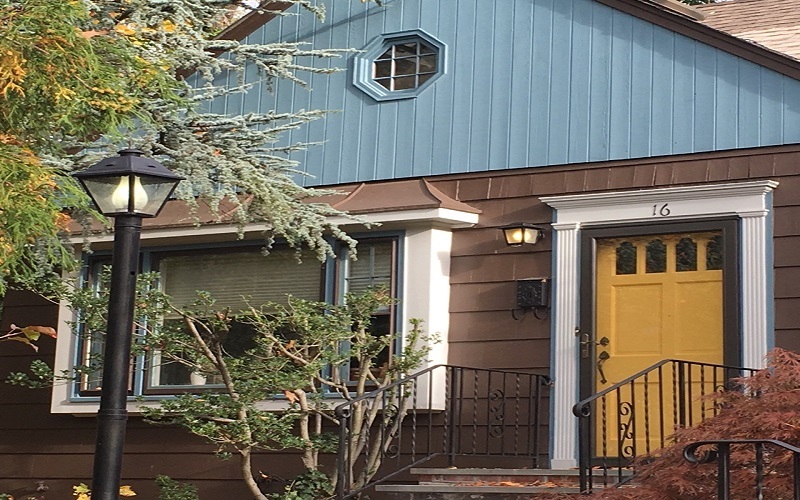 We have been painting homes and restoring older homes in Montclair NJ and surrounding towns since the early 1980’s. Our work philosophy known by our costumers as GIKAS WIZARD is creatively carried from project to project enhancing your home with texture, colors and details in order to comprehensively restore its charming properties. Adding a new deck or restoring and old one will add more functionality to your home and allow you to enjoy all of your home. We will color match or coordinate your colors and use fine detail for your interior and exterior painting. Along with wood or tile floors, Gikas painting will help you bring your home to it full beauty and value. While most painting companies think that house painting is just a coat of paint. If you want to transfrorm your home by interior painting in Montclair, Gikas painting is here. Our team with professional painters provide you solutions in order to change the mood and dynamic of your home. Our team is ready to get started on your exterior home painting project. We know how importart is the external appearance of your home so we can create the impression you want. Also, your exterior painting projects can be customized to your specifications. Trust Gikas painting for carpentry services in Montclair. Our highly skilled and certified members can offer you carpenter services in your home for all types of woodwork. Gikas painting will take care to ensure your satisfaction about your roofing project in Montclair. When select Gikas painting, you are investing in high-quality construction methods. We make our work available to you when you are in need of roofing services and you will see the results on time. Gikas painting can make putting a new floor an easy procedure. We are focused on providing high-quality flooring services in Montclair and we are trying for customer satisfaction about all our works. Vote For Us As Best of Essex! Only a few days remaining to cast your vote for Gikas Painting as Best of Essex! It’s that time of year again! Time to cast your vote in the annual Best of Essex Reader’s Choice Awards conducted by Suburban Essex Magazine for the best painter in Essex County. This distinguished honor is bestowed only upon those businesses that strive for 100% client satisfaction for their quality work. If you feel that Gikas Painting restored your house to its natural beauty and transformed your dwelling into a home, we would appreciate your vote by following the hyper link below. It will take less than a minute of your time. Our commitment to your satisfaction and our drive to exceed your expectations, has been the keys to our family owned business for more than 34 years. For Gikas Painting, it is more than a job, it is our reputation and legacy that drives us to beautify our surroundings, one home at a time. Owning a Victorian home, you may know that each home has its own character and craftsman qualities. They are beautiful however the beautiful architecture gives way to the ancient antiquity and runs throughout the home including the wiring, walls, plumbing, roofing and windows. Sometimes they are easy fixes, sometimes a complete reconstruction is needed. At Gikas painting We have been painting and restoring older Ornate and decorative, Victorian homes in Montclair, North New Jersey and surrounding towns since the early 1980’s. Like most things of beauty, your Victorian lady with its ornate exterior decorations, dramatic cupolas, looming towers, fancy turrets, rounded porches and balustrades needs special attention. Most of the homes with Victorian architecture were built between 1840 and early 1900’s and were built as a result of the Industrial Revolution and railroads. We’ve painted and renovated hundreds of Victorian homes in NJ and our pictures tell the whole story. We understand color placement is the most important feature and requires an understanding of the your buildings architecture. A Victorian home‘s exterior is comprised of at least three colors; some have as many as nine different hues and shades. Darker colors are meant to enhance unique architectural details, and outlining windows lends character to the home. Services we provide: Victorian interior Painting, Victorian home, contractor Services Jersey, Home restoration, Victorian Renovation, victorian restoration, Painting Victorian home, Victorian carpentry, Victorian painting, Victorian interior repair, Victorian painting, exterior painting, victorian roofing, home siding, aluminum siding removal, Victorian Decks, Victorian gutter repair, Victorian architectural trim work, Victorian wood floors. Natural stone is ageless, timeless and beautiful and has been popular for use on floors for centuries because it brings the colors and texture of nature to our homes and adds a quality and warmth to a room that’s not possible with any other material. Porcelain is usually judged by how well it mimics the natural stone and Ceramic is best to use for its richer solid man-made colors Natural stone refers to a variety of mountain born materials including Slate, Marble, Limestone, Travertine, Granite, and Sandstone. Applications include floor tiles, wall tiles, vanities & other surfaces, fireplaces, columns, balustrades, water tables, steps, thresholds & windowsills. We offer some of the most desired services in the industry. Top of the list is removal of old Aluminum siding and restore the original Architectural look and feel. Basic home maintenance such as replacing your stone or tile floors and floor repairs is the most visible feature in your home and can increase the appeal. Our trained estimators have years of experience and are able to provide you with an accurate price, estimation of materials and time required to complete the job up front. Our mission is to ensure your flooring project is done right and to your satisfaction. Our work philosophy known by our costumers as GIKAS the WIZARD is creatively carried from project to project enhancing your home with texture, colors and details in order to comprehensively restore its charming unique properties. 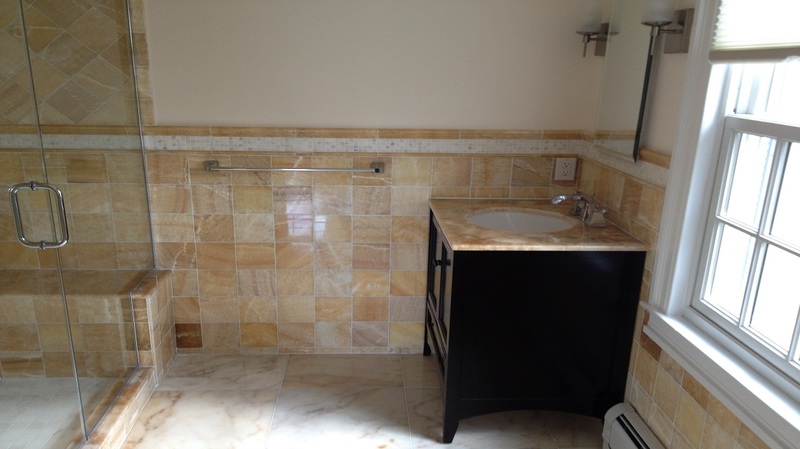 Another first impression that potential buyers have of your home is your stone or tile floors. We have been restoring / replacing stone or tile floors in older homes in Montclair and surrounding towns since the 1980’s. We have the experience to make effective use of modern products on the floor of your home that can add thousands of dollars to its value. A newly restored or replacing stone or tile floors will be worth more and it may also attract a higher number of buyers and is a worthwhile home improvement project. At Gikas painting, we are a professional stone or tile floor contractor, paying attention to detail is a part of the job and we understand that it is our responsibility to provide a quality interior painting job to you, the homeowner. 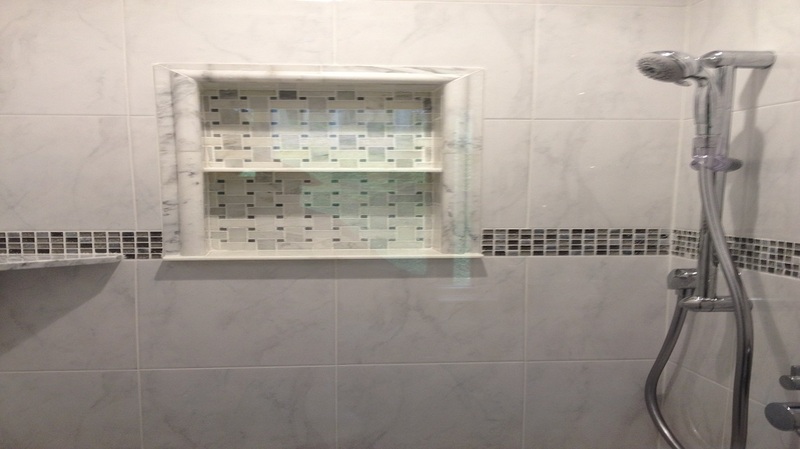 Our professional stone or tile floor construction crew will have the right tools for the job and the tricks of the trade and the techniques to get high quality results.